The Financial Crisis that has plagued the United States since 2008 is widely publicized, but little media attention is paid to the financial crisis that has plagued lower-income minority communities for the last forty years. 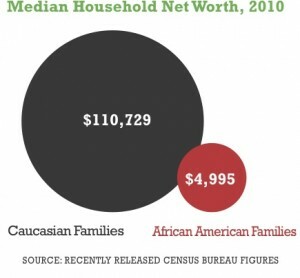 According to a recent study conducted by the Institute on Assets and Social Policy (IASP) at Brandeis University, “The wealth disparity between Caucasian and African American households has more than quadrupled, regardless of income bracket.” Predicated on economic data from 1984 to 2007, the IASP study indicated that the average Caucasian family in the sample group held around $95,000 more in assets than the average African American family. Additionally, the study found that middle-income Caucasian families have more assets (stocks, bonds, business interests, real estate other than primary residence) than high-income African American families. How does this impact our students, parents and education system? Parents do not have the tools or foundation to offset this disadvantage, and schools are stuck with the blame for students’ lack of success. According to the US Department of Education, “Nearly half of the nation’s African American students attend high schools in low-income areas with dropout rates that hover in the 40-50% range.” The Kemet Institute has laid the foundations of wealth building into lower-income communities and the working class since 2001, giving them the tools necessary to build generational wealth and start their own businesses. These tools have sparked an academic revolution. Now students and parents can take the tools of education and apply the concepts of Kemet to change their family’s financial landscape and maintain success and wealth.